Looks like a piece of jewelry to me. Looks like some kind of jewel!! I’m going along with the jewelry idea… maybe a garnet? A stone on a bracelet? 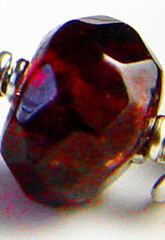 I think kimmer is correct: a garnet. I’m thinking a Garnet ring. I have one work to guess that it is a love stone – given by a very special pirate to his very special mate! A bead from an earring?